the brother of the founder of NECCO in the 1860s. Remember, this was Abe Lincoln's era, so you know they've been around for a while. 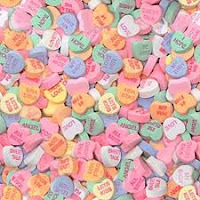 Candy hearts were originally printed with hand tools. It seems like a lot of work, but some people will do extraordinary things for love. It took about forty years before the ones we are familiar with went into production. Today, over 8 billion of these chalky hearts are produced annually. They're made from late February until mid January of the following year, averaging about 100,000 pounds a day. They sell out in about six weeks.